Armstrong Steel Buildings recently announced the supply of an Armstrong pre-engineered metal building to The Bridge in Kennett, MO. The twenty-five thousand square foot state of the art steel building is to be used as a worship center for Dunklin County residents. DENVER –The Bridge Church located in Dunklin County contracted Armstrong Steel Buildings of Greenwood Village, Colorado, to supply them with a custom pre-engineered steel building. 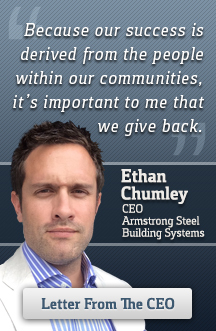 Armstrong Steel is sensitive to the pressures felt by church pastors and their respective church building committees, recognizing that each church community has a different vision for their facility. The custom pre-engineered steel building includes wet stamped blueprints, an engineered foundation design, upgraded baked on Kynar paint coatings, and a collateral load upgrade to 3lbs psf to support HVAC ductwork and drop ceiling. Their Armstrong Steel Building also includes a 40 x 32 portico as well as premium sculpted gutters and downspouts. Armstrong Steel Buildings gutter and downspout system promotes proper drainage to channel runoff away from the structure and prevent stagnant water in parking lots and areas adjacent to the church. Construction is winding down and coming to a close for the custom Armstrong Steel building 158’W x 158’L x 16’H. Once complete, the community in Dunklin County will have a beautiful Armstrong church building sitting on 6 ½ acres to be utilized for fellowship, education and worship. This Armstrong Steel pre-engineered metal building will house a congregation of well over three hundred and during unforeseen weather conditions will serve as a shelter for those in need. “You guys just keep coming through for us and we want to give you and Armstrong a public pat on the back," said Donnie Davidson of The Bridge.